Fighting a mascot is a bad idea—mascot’s advantages: padding, potential athleticism, people care about it more than you—and it becomes an even worse idea when the cameras are rolling. The Chicago Blackhawks’ Tommy Hawk scuffled with a fan after Friday night’s game, and he handled himself well. What’s known from the clip is that “McFadden hates the hawks.” Is McFadden the guy sparring with a mascot? If so, he’s not very good. The person inside Tommy Hawk, on the other hand, might’ve wrestled in high school or college. There’s a decent suplex a few seconds in—should’ve lowered his knees a little more on the pickup—and Tommy did a solid job of controlling his opponent even as he worked his way up to neutral position. 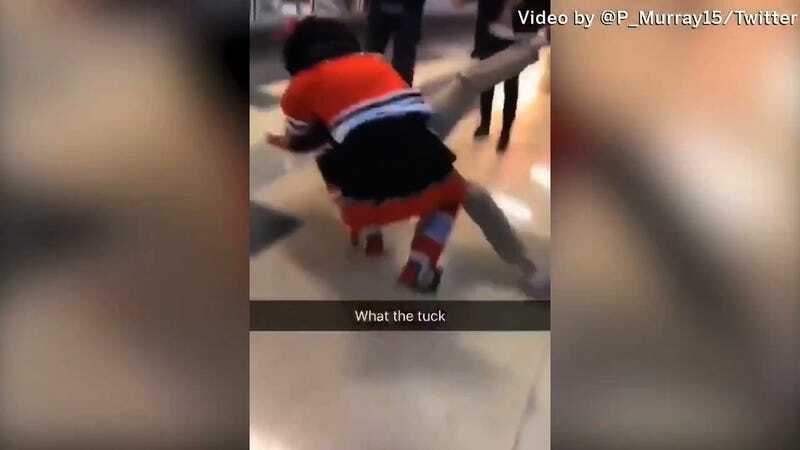 According to the Chicago Sun-Times, police said they were notified of a disturbance at the Blackhawks’ arena at 11:15 p.m. Friday, when a man punched Tommy Hawk in the face and put him in a headlock. Maybe those punches happened before the video, because Tommy Hawk was holding his own. If you know more about what went down, or have footage of more Tommy Hawk takedowns, drop a line at tips@deadspin.com.